Men in Black 3 arrives in theaters this weekend after perhaps the most tumultuous production periods of a major blockbuster in recent memory. But don’t take my word for it. 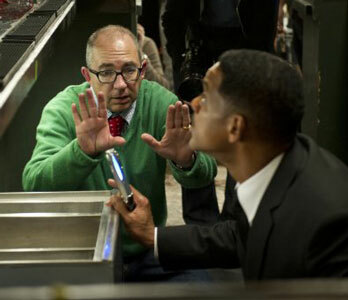 Ask director Barry Sonnenfeld (who also directed the first two installments), who reveals that like other rushed-into-production “threequels” Jurassic Park III and Alien 3, Men in Black 3 started production without a finished script. He tells Reuters, “We had a script and knew where we were going, but only the first act was ready to shoot. So we shot the first act up until just before Christmas. We scheduled the movie to have a several-month hiatus because the other acts still needed additional pre-production. So instead of coming back from Christmas break two weeks later, we came back and started pre-production on those next two thirds of the movie. We didn’t start shooting for another six or eight weeks after that” (Note: shooting didn’t actually start up again until March). It will be up to audiences to see if the good outweighs the bad: Men in Black 3 opens this Friday at multiplexes everywhere.